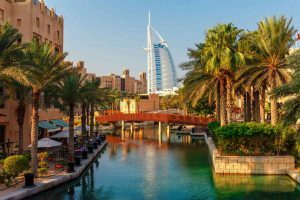 Discover how to spend the day in Dubai! If you’re lucky enough to travel to Dubai or have a layover in the city, it’s best to plan ahead. From perusing the sights to sampling local fare, there never seems to be enough time to experience everything in the largest city in the UAE. Discover how to spend the day in Dubai! Before Dubai erupted into the city of skyscrapers it is today; the metropolis ran on souks (markets). Start your day at a traditional gold and spice souk; just a short drive from the airport. Immerse yourself in the vibrant colors and scents of Dubai, and enjoy the view of the waterfront just beyond the souks. Sunset Beach isn’t just a great place to relax after a long flight; it offers one of the best views of the Burj Al Arab. As the third tallest hotel in the world, the Burj Al Arab holds 28 double-story floors that accommodate 202 bedroom suites. Take a picture of the massive hotel while dipping your toes in the Persian Gulf. The Dubai Mall is the largest shopping mall in the world! While it’s easy to spend the entire day at the Dubai Mall, we recommend that you take the time to check out the indoor zoo that features penguins and crocodiles. The Palm Jumeirah Boardwalk rests on the rocks of the Palm’s breakwater, and stretches over six miles long! Not only does the boardwalk offer spectacular views of the city and Dubai’s culture, but visitors can also enjoy one of the many shops and restaurants along the way. Stop and relax at a glass-encased cafe, and enjoy the picturesque views of the Dubai skyline. See the world from the 124th floor of the Burj Khalifa! The tallest building in the world offers an exceptional view of the city from its observation deck, complete with tall glass walls to allow for optimal visibility. The building is so tall; an engineer must advise residents where to place their furniture so that the weight is properly distributed! Explore Dubai on the Destination Dubai trip! Find out for yourself why Dubai is one of the world’s most intriguing destinations. If you have any questions or want help booking your next adventure, please contact AESU by calling 800-638-7640, or fill out the contact form found on our website! Follow us on Facebook, Twitter, and Pinterest for news and updates. This entry was posted on Wednesday, February 7th, 2018	at 11:27 am	. You can follow any responses to this entry through the RSS 2.0	feed. Both comments and pings are currently closed.